A picturesque seaside resort with roaming hills and warm sandy beaches, La Jollais one of the prettiest places in all of California and a must-visit location for anyone in the San Diego area. Boasting 7 miles of sunny coastline along the warm, welcoming waters of the Pacific Ocean, La Jolla is a real haven for anyone who wants to get outdoors and make the most of the beautiful Californian weather. There are plenty of great activities to enjoy in and around La Jolla, with various stores, museums, art displays, and even a PGA golf course, but one of the most thrilling and top rated attractions in the whole area of La Jolla is the La Jolla Zip Zoom zip line tours. With four great courses to enjoy, La Jolla Zip Zoom provides a real adrenaline rush and unimaginable views to every participant. It's no surprise that this is one of the most popular activities in La Jolla! A thrilling adventure for participants of almost all ages, the La Jolla Zip Zoom zip line tours are among the best in the entire state of California. If you've never enjoyed a zip line tour before, this is a great place to start. La Jolla Zip Zoom features four different courses, with each one designed to suit a different crowd. The simplest course runs for just 300 feet of cable, while the longest runs for a whopping 2,700 feet. Riders can fly at speeds of up to 55 miles per hour, feeling like birds soaring through the skies from one platform to the next around the beautiful hills and valleys surrounding La Jolla. Enjoy views of the town itself, as well as the Pacific Ocean stunning scenery in every direction as you glide along. Each guided tour features a full introductory tutorial going over all the basics and necessary safety instructions, and friendly guides are always on hand to answer any questions visitors might have or calm any possible worries or fears. These guides will lead the zip line groups out to their chosen tour, offering interesting information about the La Jolla area along the way. Once you arrive at your chosen zip line tour, you'll take to the skies and enjoy the ride along the various lines, with each zip line tour lasting around two and a half hours in total. The lines even feature parallel cables, allowing two people to go down at the same time and race against each other - always a big hit with siblings, best friends, and couples. Whether this is your first time taking a zip line tour or you happen to be a seasoned ziplining pro, there are some specific rules and requirements to be aware of at the La Jolla Zip Zoom zip line tours. First of all, it's worth noting that despite being an outdoor activity, these zip line tours don't get canceled in the rain. The zip line tours run almost all year long and in almost all weather conditions, and can even be quite a lot of fun to do on rainy days, so you don't need to worry about planning ahead and worrying the weather reports. Tours may be canceled in very extreme conditions, but this only happens rarely and any tours that do get canceled are fully refunded. Like with any zip line tour or experience, the La Jolla Zip Zoom has some height and weight restrictions to be aware of. There's no minimum age limit, so kids can take part, but the minimum weight limit is 65 pounds. The maximum weight limit is 250 pounds. The cables are strong enough to support weights much heavier than that, but the weight limits have to be put into place because of the size and shape of the harnesses. All participants are weighed in advance of the tour to ensure that everyone is fully safe, and waivers need to be signed too. 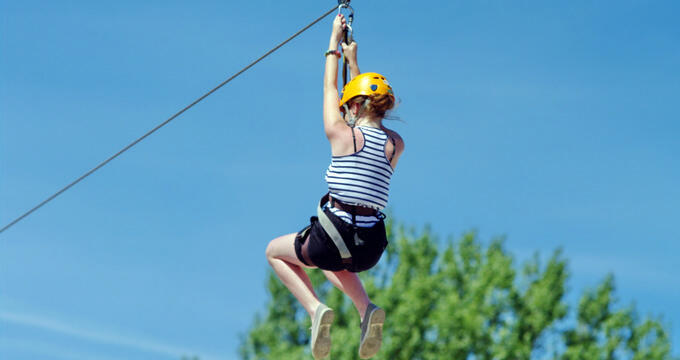 Concerning height, each participant must measure up at 48 inches or more in order to ride the zip lines. All equipment is provided, so you don't need to bring anything along, but participants are urged to wear close-toed, close-fitting shoes or footwear to avoid any accidental losses, as well as dressing appropriately in comfortable clothing. Women should wear pants rather than skirts, and guests with long hair will need to tie it up for safety reasons too.